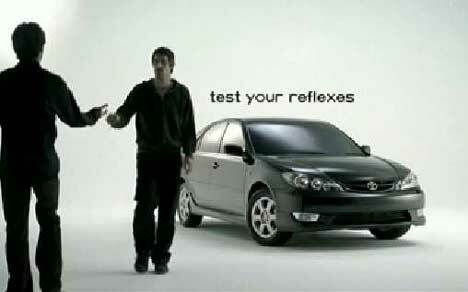 Toyota promoted the Camry V6 Sportivo in 2005 with an unnerving television commercial, ‘Knives’. It’s a wet night. A man walking through the city is startled by the sound of a kinfe ripping through the roof of the bus shelter. It’s the beginning of a knife storm. More and more knives fall from the dark sky. On the street cars are crashing. He darts over the road, leaping cars and dodging knives. He reaches the safety of an office building. But then he’s out again – testing his reflexes against the power of knives. As he lands on the roof of a car his shirt sleeve is ripped by a knife. He rolls over, hits the ground and examines his arm. 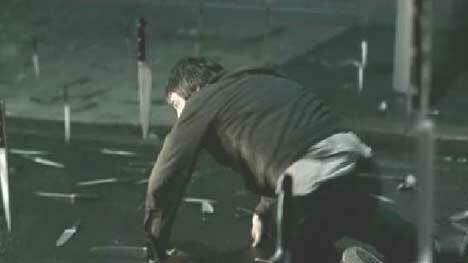 Toyota ‘Knives’ was created at Saatchi & Saatchi Australia, Sydney, by creative director David Nobay, copywriter Tim Brown, art director Peter Buckley and agency producer Scott McBurnie. Director was Steve Rogers with Revolver Film, Sydney, with producer Georgina Wilson, production designer Annie Beauchamp, and director of photography Danny Ruhlmann. One of the reference points for Steve Rogers was the rain of frogs from Paul Thomas Anderson’s 1999 feature film Magnolia. The film was shot in Sydney’s central business district over four nights. Editor was Stewart Reeves with Guillotine. Audio was engineered at Human Music and Sound Design. Visual effects were developed by Animal Logic, Sydney, by VFX producers Sarah Beard and Pip Malone, VFX supervior Andy Brown, designer Thomas Diakomichalis, Lead compositor Leoni Willis, 3D Lead Nathan Mitchell and a team of twelve animators perfecting the effect of falling and bouncing knives.